What's cute, furry, hungry and about to lure your kids into 7-Eleven stores? Domo, the Japanese stop-action character with the huge open-mouthed look, is the centerpiece of a new marketing campaign for the stores and its Slurpee drinks. The goal? To attract the character's fans, who tend to be between 16 to 24 years old, with collectible Slurpee cups and straws, Evan Brody, marketing manager for Slurpee and Big Gulp beverages, tells WalletPop. And for slightly older Domo fans, say those in their early- to mid-20s, the store will offer a special promotion on coffee: 99 cents for the coffee and a paper cup decorated with Domo's mug. The promotion marks a new direction for the stores, which typically tags its campaigns to big tent-pole movies such as this summer's "Transformer" film, Brody says. "This is unique because it's not a massive Hollywood guy," Brody points out. "It's underground and you have to be in the know." So who is Domo? The character began in 1998 as a mascot for the Japanese broadcaster NHK and was supposed to run as a six-month campaign, but his popularity with viewers kept Domo going, Brody says. Domo's characteristics are that he loves to eat everything except apples and he says only one word: his name. The 7-Eleven campaign, which began Oct. 1, will run through Nov. 15 and features the "Fuji Freeze" flavor, which, in a reference to Domo's tastebuds, is apple flavored, Brody says. 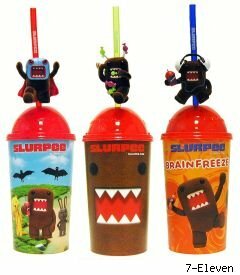 The Slurpee cups and straws will cost $1.99 each, and the stores will include Domo merchandise such as comics and USB drives. So how successful will the character prove for 7-Eleven? The company is excited by the reaction it has received to its Facebook video of Domo drinking a Slurpee and getting brainfreeze (as of Friday, the video had more than 1,000 fans). And it's also taking a page from Target Corp., which last Halloween featured Domo in a promotion that included stuffed toys, lollipops and other candies. While a Target spokeswoman says the company isn't returning Domo this Halloween (Instead it has a promotion with Skelanimals), the retailer considered last year's campaign to be a hit. 7-Eleven's merchandise team "did look to what Target did and their success," Brody said. "It was really that he had gained traction in the U.S. We wanted to take him to the next level." For a look at supermarket secrets, click through our gallery.